The Michigan Association of Recreation Vehicles and Campgrounds (MARVAC) is sponsoring the 40th Annual Detroit Camper & RV Show, February 15-19, 2006, at the new Rock Financial Showplace in Novi, Mich. New, year 2006 recreation vehicles will be on display including folding campers, motor homes, travel trailers, truck campers, park models and fifth wheel travel trailers. Display models range in price from $4,000 to more than $300,000. Attendees will receive special rebates (up to $5,000 off) toward the purchase of a new RV at the show. Booths with parts and accessories and free information on campgrounds and RV rentals will be set up at the show. The new 2006 RV & Campsite, a comprehensive guide to camping in Michigan, will be available free to consumers. Long-time RVer, Annette Kaufman presents "The Organized RV: Big Ideas for Small Spaces." 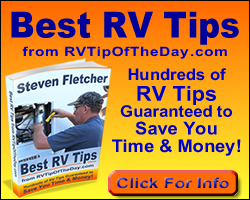 Seminar attendees will learn creative solutions for organizing your RV. The 40th Annual Detroit Camper & RV Show will be held at the new Rock Financial Showplace and is open weekdays 2-9 p.m., Saturday 10-9 p.m. and Sunday 11-6 p.m. The cost for adult admission (ages 13 and up) is $9; children age 12 and under are admitted free! Seniors admitted for just $5 on Wednesday, February 15, and Thursday, February 16 (no coupon necessary). The show is sponsored by the Michigan Association of Recreation Vehicles and Campgrounds (MARVAC), a member organization representing all aspects of the camping and RV industries. Consumers can call 517-349-8881 or visit http://marvac.org for additional information on the RV show.